Just as TV networks saw their business models shift when the streaming video craze swept over the industry, video game companies similarly are having to respond to changing consumer preferences. 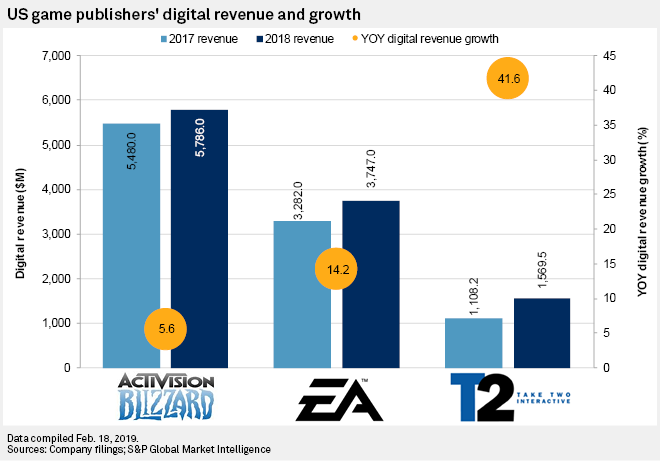 Major U.S. publishers, including Activision Blizzard Inc., Electronic Arts Inc. and Take-Two Interactive Software Inc., all reported significant year-over-year growth in digital revenues with an increasing number of consumers opting to purchase downloadable copies of games over physical discs. Sales of digital add-ons for games — ranging from small microtransactions to full-scale content expansion packs — also continued to gain momentum. 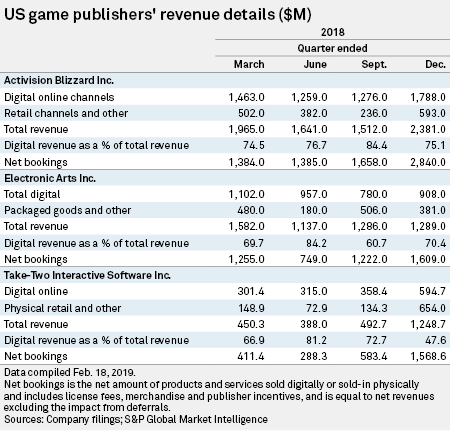 The digital shift in the video game industry has prompted publishers to transition their key titles into live services that can function as recurring revenue streams. The companies also are actively seeking out methods to deliver this content directly to consumers in a bid to maximize profits. This strategy has led to a recent surge in online storefronts on the PC, where publishers can circumvent royalty fees they pay to offer their games on Microsoft Corp., Sony Corp. and Nintendo Co. Ltd. consoles. EA, for instance, was among the first major third-party publishers to start offering its titles exclusively on its online PC store, Origin, and analysts think this trend will continue to gain steam. "I suspect most of the big publishers that either don't have a store of their own or haven't put much effort into it to date are going to step up investments in the next 12 months to see if they can make it a significant profit center," said Lewis Ward, research director of gaming and virtual/augmented reality at research and advisory firm IDC. The growing interest in establishing proprietary digital storefronts in many ways mirrors recent moves in the broader entertainment industry, according to Michael Goodman, director of digital media strategies at data and research firm Strategy Analytics. "Historically, film and TV studios needed third parties such as networks and cable TV providers," Goodman said. "But now they are becoming much more reticent about distributing their content because they can go direct to consumers with their own platforms, such as Walt Disney Co. is doing with its streaming service. Gaming companies are pushing to do the same now, where they can keep their best content exclusive to their own platforms." Taking another cue from streaming video services, game publishers are evolving their subscription plans to offer consumers games on demand. EA was the first third-party publisher to embrace this subscription model, with its EA Access and Origin Access services for Xbox consoles and PCs, respectively. Xbox Game Pass also now allows subscribers to play every new Microsoft-published title the same day as its release, while Sony added a library of more than 275 downloadable PlayStation 4 games to its PlayStation Now streaming service. Although recurring revenue streams from subscribers are appealing, many in the industry are still cautiously eyeing the possible repercussions of offering a title that can cost more than $60 at retail as part of a subscription that can be canceled after a month. "I do believe that some subscribers might cancel after finishing the newest game they wanted to play, but the vast majority will keep their subscription because of the online multiplayer component of those same games," said Greg Potter, an analyst with Kagan, a media research group within S&P Global Market Intelligence. "Publishers are okay with this model because hit games often have multiple revenue streams other than the purchase at the point-of-sale." IDC's Ward cited recent survey data indicating U.S. households that subscribed to EA Access and Xbox Game Pass in the third quarter of 2018 earned more than nonsubscribers and had more gamers per household. "This implies that their core audiences are wealthy households that can afford to spend more on games, and if several people play games these subscriptions are even more attractive," Ward said. "There's certainly a tipping point beyond which the services could cost publishers money relative to what they would have made absent these subscription plans, but we're not there yet." According to Goodman at Strategy Analytics, one obstacle that could hinder the growth of game subscription services is the number of offerings that consumers may feel they need subscriptions to. "The question then becomes, how many subscriptions do consumers draw a line at?" Goodman said. "There are a lot of companies that want to reach into our wallets, and that number will only increase as more content makers release their Netflix Inc. competitor and more game makers try to maximize profits."